Another Fate tale to be told, another (Great) Holy Grail War to be fought. The twist this time? Rather than a free-for-all between nine chosen Servants, the battlefield involves the Red and the Black sides, each getting a set of nine to control as each “team” (a loose term here) battles for wish-fulfilling supremacy. Comparing with earlier installments Fate/Stay Night and the oft lauded Fate/Zero, this newest story doesn’t stray too far from familiarity. Yes, that twist sets it apart from the others, but the underpinned elements prevail. A dark tone due to deception and betrayal. Quasi-philosophical themes about the nature of man. Enough battles to fill a goblet (or, in this case, a cracked-open sphere). In short, the audience should not fear that this installment has lost its identity, for it clearly follows its brethren. Unfortunately, Fate/Apocrypha cannot muster up much of a narrative to speak of. Its action-centric sequences at least engage the audience with their multi-duel format, but they cannot always be around. And when they’re not, the lull between them becomes a noticeable slog. The mishaps are many. Subplots like that of Avicebron’s mega-golem fail to go anywhere meaningful. Plus, despite the large number of characters, not only do the disparate groupings not interact much between each other but also the intrateam dynamics fall short as well. And the overarching driving force behind the story itself feels empty as the Grail, the motivations, and the world don’t matter much in the grander scheme of things. It all combines into a rather lackluster trip as the string of events unfold. The pacing could be odd at times, too. This whole shebang has been in the making for 60 years, but about half the plot takes place over the course of a single day or so and then, in the back half, over a few more. However, the arrival and clashing of so many legendary heroes simultaneously cannot help but get the ball rolling. Not to mention that they are really vying for each other’s jugulars. So, it makes sense that it all spills forth once the game is set and ready to go. Fate/Apocrypha also seems scared to kill off any of the heroes during actual fights in the first half since many either self-sacrifice as part of the plot or die in pitiable fashion. It can leave a disappointing feeling in the stomach given how much the action matters to the show. Nonetheless, the finale pretty much makes up for this lameness as brawl after brawl has those jugulars spilling blood in combative annihilation. To the show’s credit, it blends together the morality of the situation to a notable degree. Almost nobody is all good or all evil, leading to a mixture of stances which permit the second-guessing of ideologies. Again, the characters, especially the heroes, do not communicate or converse with each other all that much, so exploring or comparing their personal ideas isn’t always on the menu. But it is, at the minimum, an option that surfaces on occasion. In the end, though, Fate/Apocrypha only really has the action going for it. Since said action is the calling card of the series, the effectiveness of its story isn’t a total wash. But because it tries for more and can’t quite get there, it wraps up as an unfavorable war that isn’t quite as “Great” as it self-describes itself to be. Perhaps reiterating already, but, without a doubt, the anime prides itself on its fight scenes and the coolness they tend to bring. But they work and don’t work. In the first few major bouts, they can be tough to follow due to the overreliance on massive, mega explosions to get across the ferocity of these duels rather than letting their swords and lances do the talking. 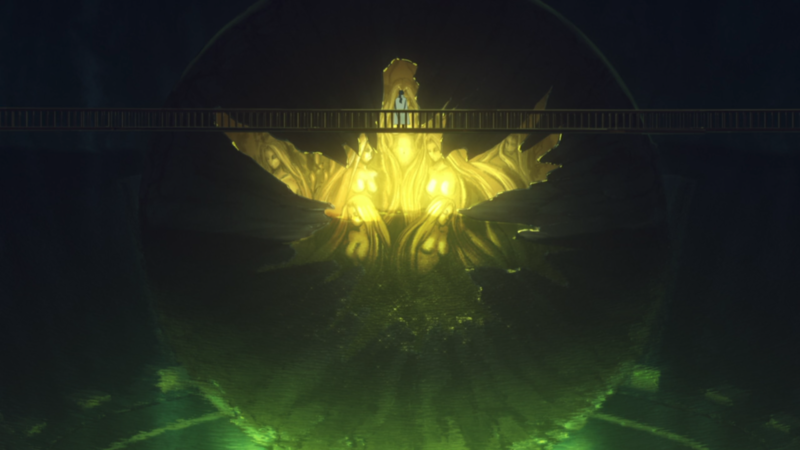 Plus, Fate/Apocrypha won’t always stand still on a shot to let the audience seep it in before it hurriedly goes to that next mammoth-sized explosion. Regardless, a spectacle erupts as multiple colors and dazzling lights dot the air when the Servants cross one another. And the show makes sure to highlight their insane abilities. Vlad’s spikes. Chiron’s arrow volleys. Frankenstein’s electric nuke. These and other powers make for visually cool moments, and Fate/Apocrypha ensures that they each have a chance to strut their stuff. In the last chunk of episodes, though, where the final fights commence, the show steps it up to that next level with several separate duels which treat the audience to many awesome battles. 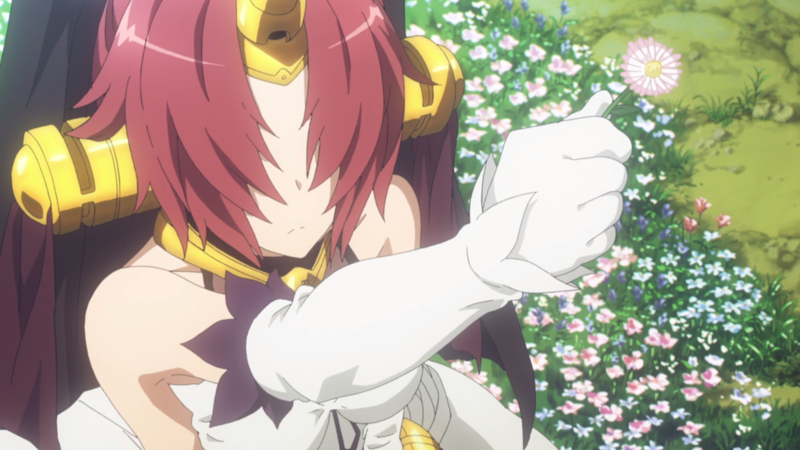 Jeanne dodging Atalanta’s demonic attacks. “Siegfried” squaring off against Karna with stylized destruction. Mordred and Semiramis refusing to give in. Astolfo charging forward upon his mighty griffin steed. Sieg and Shirou having one last hurrah. If the first half wasn’t the most captivating, the latter portion certainly assuages any further woes. Also, to the anime’s credit, a couple of scenes standout for their attempts at looser movement for a wider range of action. Specifically, Frankenstein writhing in terror from unwanted visions, and Chiron and Achilles boxing each other with brutality, demonstrate the anime risking a rougher look to its movement in exchange for more emotion and expression. Whether showcasing battles or not, the background art fails to impress. Open fields, the Yggdmillenia castle, and the floating city structure act as formidable, understandable places for the fights to unfold, but the hyper-focus on said fights leaves the rest of the setting for want. Fate/Apocrypha brings it back again with its character designs. Everyone across the board lays claim to a combination of interesting details and varied getups. There’s the regal Astolfo. The bejeweled Karna. The cat-girl Atalanta. The elven, black-robed Semiramis. The wizarding Avicebron. The knightly Jeanne. The heroes don’t just play the part; they look the part as well. So yes, the art and the animation can have its hiccups in certain areas. But, for the most part, the visuals and their presentation benefit the show and its causes. Fate/Apocrypha contains five tiers for its characters: cannon fodder, sorely lacking, supportive, respectable presence, and vital. Now, with over twenty in total that make up the crux of this story, it isn’t feasible to dive into every single one. However, using these tiers, the bigger picture can be extrapolated on. Starting at the bottom, the cannon fodder either barely matter or hardly contribute to the festivities to the point that one wonders why they were even there to begin with. Spartacus counts as the former, for he runs ahead, gets captured, and then perishes without a second thought. Celenike, the crazy psycho lady who cares more about Astolfo’s body than any magical mighty wish-granting device, counts as the latter. She could be removed from the plot, and almost nothing would be affected. Being cannon fodder is not automatically a detriment. With such a large cast, it makes sense to have fringe players in the game so that the anime can start cutting the cruft for some earlier-rather-than-later entertainment. Those who don’t contribute, though, have less of an excuse going for them. Doubly so for those who are sorely lacking in any regard. These characters are technically important, but they have very little going for them or in their favor, so they end up as weakly written. The major antagonist Shirou comes to mind first as he puppeteers the entire war from up high and in the shadows, spouting off about nonsensical salvation. The supporting members attempt to make up for the fodder and the lacking. 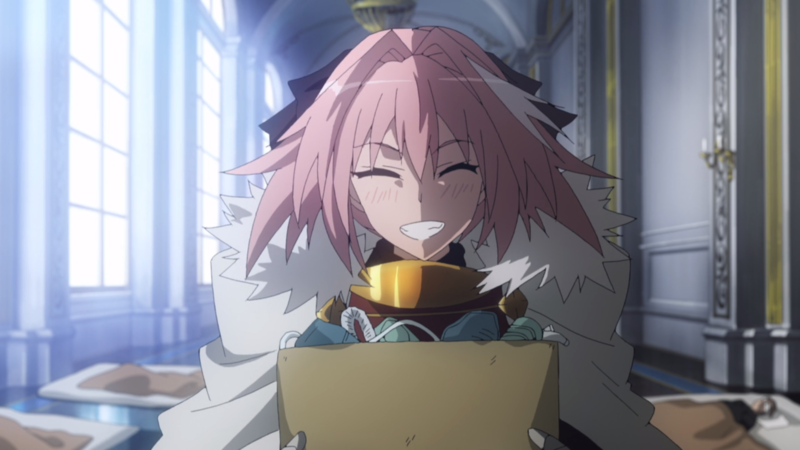 Astolfo, the jovial man who believes in the goodness of humanity, guides Sieg to safety and to kindness. Same for Gordes, the heavy-set Mage who eventually thawed his rough demeanor to help the homunculi amidst the carnage. Fate/Apocrypha also has those with a clear presence. They play their role well-enough over the course of the story, building up relationships or interesting moments while avoiding the major pitfalls for those who go sorely lacking in clout. Jeanne is key among them. She rules as Ruler over the game, protects Sieg as her feelings for him churn, makes tough decisions when required, and finds her resolute, stoic persona changed for the better come the finale. Mordred and Kairi can be placed here, too, for their general independence from both the Red and Black sides of the war give them extra freedom to jump into the fray and investigate their backgrounds. The only vital character, then, within the show is Sieg himself. 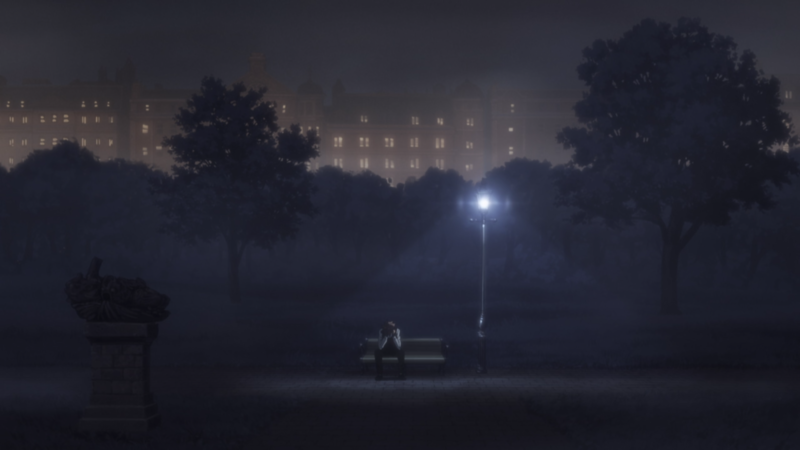 Basically a human with a clean slate in terms of memories, thoughts, and emotions, his unbelievable adventure molds him into a person of justice as the main protagonist. His time with the old man and his asides with Siegfried teaches him heart. Seeing his fellow brothers and sisters suffering instills passion in his soul. Witnessing the horrors from Jack the Ripper challenges his mind. His journey therefore transforms him into an entity filled with humanity’s greatest asset: hope. A vital takeaway, indeed. 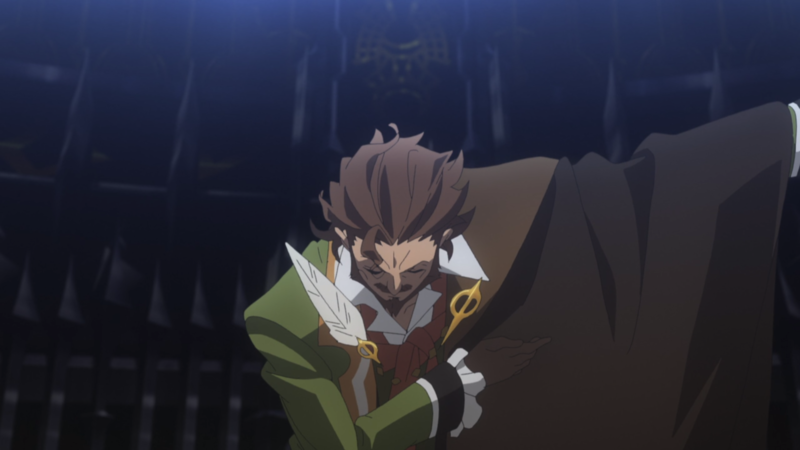 In total, this five-tiered melting pot of characters gives Fate/Apocrypha a range of opportunities and shortcomings throughout the entire season. While half of them end up as mediocre in terms of writing, the other half reach that solid level to balance everything out. 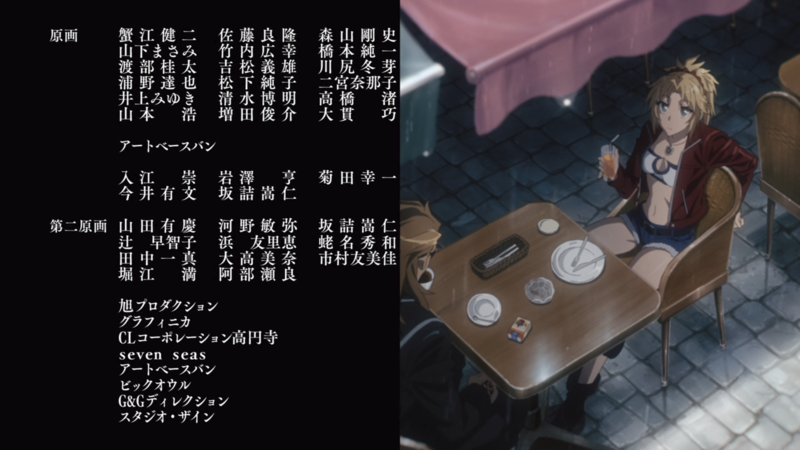 The anime sets the audio stage with its first opening track, titling it “Eiyuu Unmei no Uta”. Off-kilter instrumentation, such as the twinkling of a music box and some bag pipes, as well as the whispering vocals get at creepy vibes for a menacing mood. 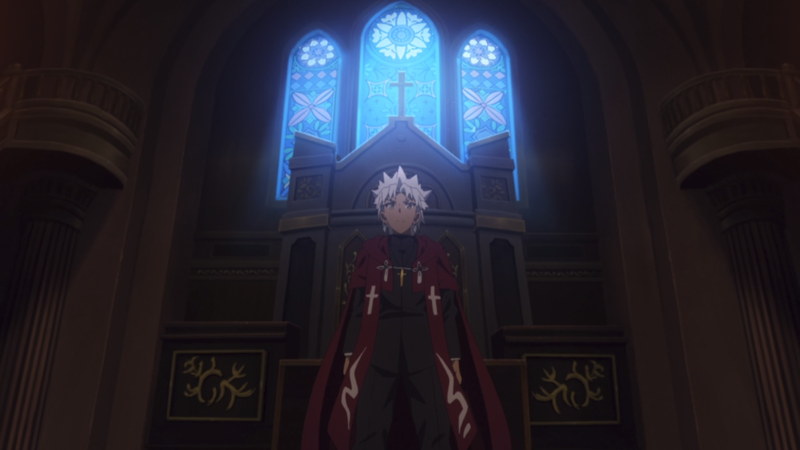 But the pounding drums and the majestic choir remind the listener that Fate/Apocrypha has its intensity when it so chooses. While the entire song may be a bit too all-over-the-place in terms of arrangements and styles, the strong female vocals and the variance in general combine into an interesting piece. “ASH”, the second opening track, does not surpass its brother. It isn’t a horrible song either by comparison or individually. That’s thanks mostly to yet another bout of strong female vocals and the nice orchestral backing from the piano keys and the violins. The little stopping flourish near the end is nice, too, but it all around misses out on the same sense of intrigue with its somewhat bland composition. It’s tougher to vouch for the first ending track, though. Titled “Désir”, it has almost nothing of note about it as its first half lacks the finesse to follow-up with its loud second half. Which is why the second ending track “KOE” works. Its slow, methodical start leads into a smooth acoustic-and-electric guitar segment, a combo which contrasts rather harshly and nicely with the quick-and-chaotic clashing which happens in Fate/Apocrypha on a regular basis. In this case, following it up with a fast drum beat and a grandiose finish flows well with the earlier foundation. Similar sentiments exist for the original soundtrack. While the songs are normally drowned out by the yelling and the high-octane sound-effects, the quieter moments grab the ear due to their contrasting lightness. Especially the little piano tune. Sure, maybe it’s overused, but it cuts through the darker direction of the anime with a tenderness that keeps that aforementioned hope alive. And while the voice acting is by no means repugnant, it also doesn’t attain any noteworthy spots. The only person who comes close is Rumi Ookubo as Astolfo who helps to sell the “illusion” of his feminine charm. 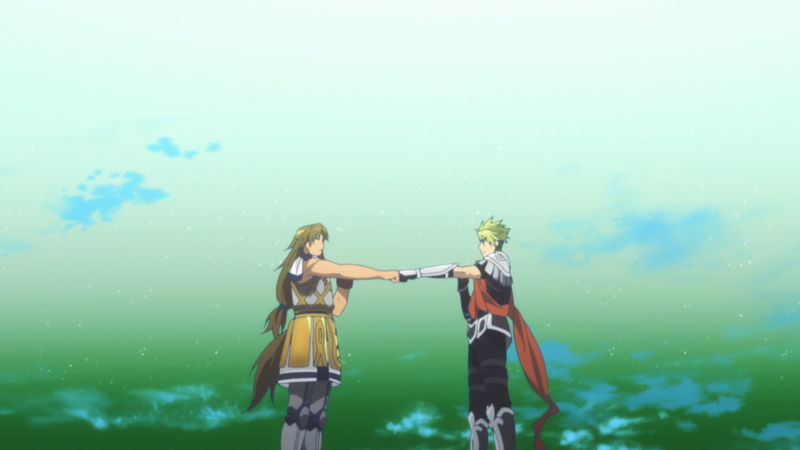 Altogether, the audio elements within Fate/Apocrypha manage to meet that middling ground. I have a tiny bone to pick with the Fate franchise at this point. Having seen several of its stories now, it would be nice to see someone actually win the whole ordeal for once. I know. Part of the point is that the wishes and the Holy Grail itself are not the true goal. “It’s not the destination but rather the journey that matters most.” I get that. I even love such platitudes. However, each story has been some interpretation of that concept. And no, these bittersweet endings, such as was the case in this one, don’t count. I want to see a true winner, someone who fought and battled and could legitimately be claimed the victor. As opposed to the same-old outcome of nobody wins or someone “won” in quotations with maybe an asterisk or two. Rant aside, this show had a host of characters that run the gamut. Near the top, I was quite surprised at how much Astolfo grew on me. In the beginning, I admittedly viewed him as an annoying player in the game. But, as the episodes progressed, and his honest sincerity shone through, he slowly became one of my favorites around. Same goes for some of the less exciting Servants. Chiron, Karna. I respected their tenets and their virtues, so their presence made the anime a more enjoyable time. Mordred and her Master Kairi were likable, too. Shakespeare was initially near the top of my rankings, but he wasn’t around or as impactful as I would have desired. That’s why Frankenstein was my top favorite. Not just because the novel she comes from is likewise one of my favorites but rather her other traits. Her fierceness. Her gentleness. Her cuteness. I was sad to see her have an early exit, but a later-surprising plot point (while perhaps slightly contrived) got a thumbs-up out of me. What gets a thumbs-down, though, are a few of the other characters. Specifically, Darnic, Jack the Ripper, and especially Shirou had me shaking my head or rolling my eyes at their actions. Darnic was too comically evil. Jack’s cute-girl-but-really-a-demented-cannibal personality was not scary or endearing but laughable. And Shirou was pretty much impeccable and therefore untouchable at everything he said or sought, an archetype I loathe without end. As for nearly everything else in this anime, I was pleasantly entertained. Some clashes were more interesting than others, and several relied too much on giant explosions instead of letting these warriors duke it out, but they had their neat moments here and there. 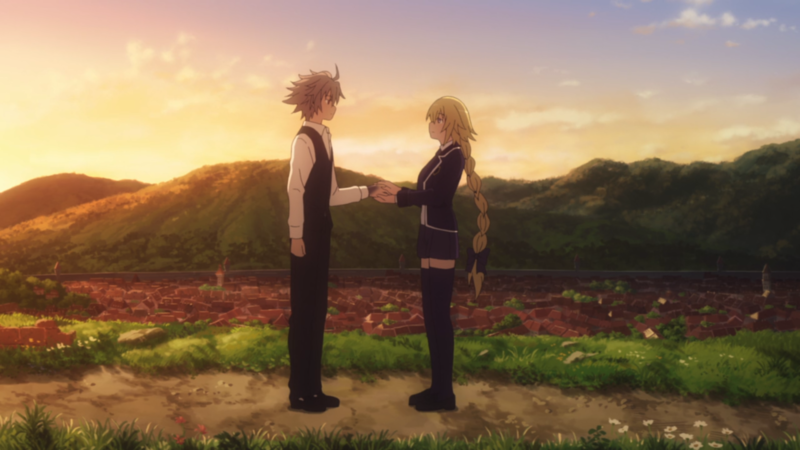 I also appreciated the romantic angle that Sieg and Jeanne’s relationship took on, for I wasn’t exactly expecting such a development before getting into the show. They were sadly both clueless when it came to their feelings. Her because she doesn’t understand them; him because he’s a homunculus that doesn’t automatically have them. But the tiny spark and words shared between the two got my romance gears spinning to at least a small degree. Altogether, it had enjoyable parts and others not so much. Thus, as a complete package, it lands somewhere within the average field. Neither overly impressive nor horribly awful but instead a nice-enough project for this ever-popular franchise. 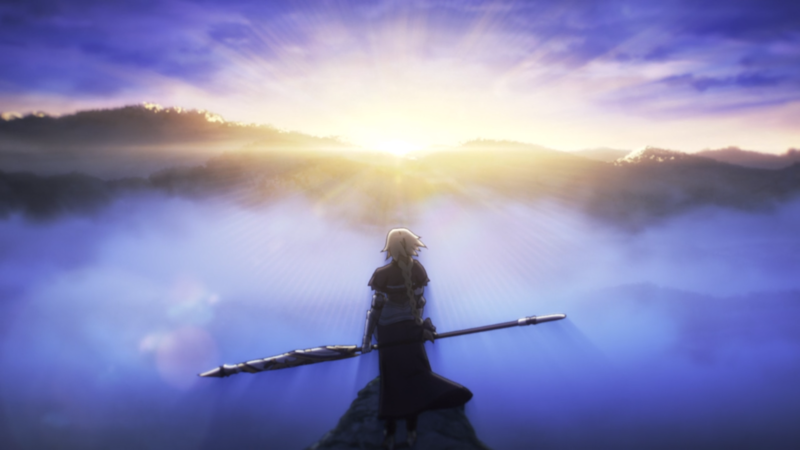 Fate/Apocrypha weaves a tale of guts and glory that called in sick a few times. An action-oriented story cannot hide its questionable choices, and not every character has the luxury of strength. Nevertheless, the production values do have their high points, and certain aspects can be fun to follow. And that’s far from a dubious proposition.